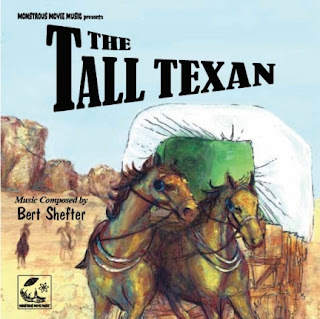 The Tall Texan [MMM-1974] features an impressive western score by Bert Shefter, usually known as Paul Sawtell’s partner. This solid 1953 Lloyd Bridges’ movie tells the story of gold and greed in the wilds of New Mexico, and it was edited and directed by the award-winning Elmo Williams, who contributed to the research for the liner notes. Soon to turn 100, Mr. Williams is a legend as an editor, winning an Academy Award for his extraordinary work on High Noon. This CD is dedicated to Mr. Williams. 5/5 Saddle up them horse to this classic film you may or may not have heard of, that doesn't matter... because the score brings back those cowboy memories. You will not be disappointed by this release, they take extra care to assure your experience... so close your eyes and journey back with us.